Magilou is usually seen as the Life of the Party, but her true intentions remain a mystery. Stats will be updated as we go along. Magilou’s accent is known as the Kakikū accent. Magilou made her first appearance when our heroine Velvet Crowe and Seres made their way out of the prison island – Titania. As Velvet escapes, she is joined by Magilou and Rokurou Rangetsu aboard the ship. They sailed to Hellawes, a nearby town found north of the Nozgand region. As they reach the town, they needed to take a detour since the perimeter is being secured by exorcists. The group managed to reach their destination without trouble. Through their excursion, the three managed to eavesdrop intel on the top exorcists; this was followed by their encounter with the Head of Hellawes, Teresa Linares who was guarded by malakian companions. Teresa glances at the three starting with Rokurou, Magilou, and finally focuses her attention on Velvet. By the time Velvet and Rokurou finished their exploration, Magilou decided to stay in the town. A few moments later, she was caught eavesdropping by exorcists guards and was therefore sent to the Head of Hellawes. Magilou receives a slap from Teresa since she claimed that someone revealed to her that a certain “black-haired lady wearing black clothing” was the cause of her younger brother’s eye injury. Velvet and Rokurou received information on Magilou’s confinement and therefore requested Dyle to have a ship ready to sail to save Magilou. She functions primarily as the Magic Artes user of the party, however during the early stages of the game, she makes for a great supporting role with healing artes. Her Arcane Artes allow her to deal damage although at the cost of using more Soul Gauge (SG), thus it is recommended to decide carefully which Arcane Artes to use. If you can time right, Magilou is capable of using a number of Holy Servant Artes to support the party during long battles by doubling as an attacker. One strategy is to use “Tamayura” on a nearby enemy due to its quick animation. As a bonus, when there are more enemies nearby, it does even more damage. “Furisode” is also recommended for crowd control since it has a wider range and stuns a swarm of enemies. Using Holy Servant Artes is Magilou’s preferred method of dealing damage. For the first arte, use one that induces recovery and follow up with another Arte that causes the Stun ailment. One of the recommended Holy Servant Artes to start a combo is a moderate Area of Effect “Healing Circle” which restores HP and “Burn” ailments of nearby allies contained in the field. Similarly, another Arte is “Flood Wall” which provides A.DEF increase and stuns nearby enemies. Although Magilou has access to Arcane Artes, her Holy Servant Artes are more effective during battle. Magilou possesses a mystic arte known as Ascending Angel. 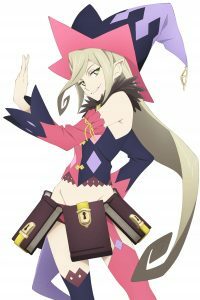 Magilou is a magical girl or otherwise known as a witch. She enforces Guardians during combat to deal not only offensive, and defensive magic but also spell-type artes. By accumulating sufficient Soul, she is capable of unleashing her Soul Break known as Spell Absorber. In addition, Magilou has access to Switch Blast known as Magilou’s Paradise. Spell Absorber Soul Break Ability; prevents the opponent from casting. The technique used after her Break Soul is dependent on the enemy’s weakness. Magilou’s Paradise Switch Blast Ability; shifts her positions with the previous controlled character, this is followed by her attack where she is seen mounted on her guardian. “Tamayura” An Arcane Arte that is a good staple to most combo chains due to its stunning effect and small Soul Gauge (SG) consumption. Healing Circle To endure the battle, Healing Circle provides a moderate amount of HP which allows nearby allies affected on the field to gain HP lost at moderate increments more than once. A combo chain that mainly uses Stun effects at the expense of a reasonable total Soul Gauge (SG) requirement. This allows Magilou to strike enemies when SG is usually low. Contrary to the above mentioned sample, this one focuses on dealing as much damage at the cost of a generous amount of SG. If “Nobirubou” and “Final Embrace” have not been acquired yet as these would only be available higher levels, the Holy Servant Arte Explode may substitute instead.